FREE 3D Training in 3D Autocad. An Autocad course in 3D covering vpoint, ucs, wcs, and polylines. Task 3 of our Autocad course in 3D is the start point for creating models in 3D Autocad. Follow the free 3D training instructions carefully. Without using Polylines or Rectangle commands, draw a four sided regular shaped box size 5" x 3" (ISO = 125 x 75 mm) in your usual way as if working in 2D, so that, when completed, the box is approximately in the middle of the grid display. a. The 'c' stands for 'close.' Note the minus value in the line above it. Now the display also shows the grid at a diagonal with the four sided box near the middle similar to Fig Tsk 3a. Fig TSK 3a shows how the screen display should appear AFTER the above steps but if it does not, the degree of Zoom in or Zoom out may vary depending on the level of CAD equipment being used. Zoom a little more if required. A chosen viewpoint always sets itself to look toward the WCS, so experiment with vpoint values and zoom out to see the full grid dots each time. Try vpoint values of 1,2,3 and 3,2,1 and think about your position relative to the UCS icon. Finish with vpoint 1,1,1. Notice the view is looking toward the Wcs origin from a position of 1X, 1Y, 1Z hence the 1,1,1 response to the Vpoint command. The Wcs icon is still in its default position. The Wcs icon was at the lower left of the screen before task 3 and all that has changed is the viewing position not the Wcs position. There can sometimes be confusion between Ucs and Wcs. The 0,0,0 location of the Wcs coincides with the limits position of 0,0. Since Wcs is the default plane, other planes are referred to as Ucs's. A Ucs is nothing more sinister than a localized Wcs, and seeing the X,Y,Z directions of a Ucs is very useful. 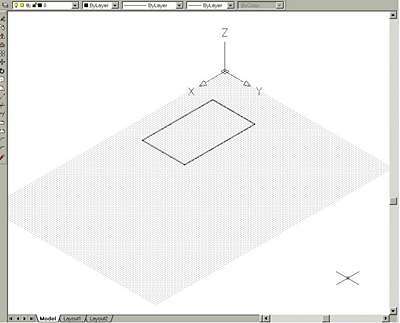 If you understand the Cartesian Coordinate System move to task 4 of this free 3D training, or read on for more explanation because the UCSicon plays an important part of this Autocad course in 3D. The Ucsicon (User Co-ordinate System icon) in the lower left corner of the screen is the start position of the Cartesian co-ordinate system for an AutoCAD. It is a right angle shape with arrow heads showing X and Y (and Z on newer software) directions. Fig TSK 3b below shows 2 icon styles and some numbers. Newer software has the icon on the left, and older software has the wide arrow style. The numbers on the right relate to "X" and "Y" distances discussed below. A position in space can be identified by its X, Y and Z distances relative to the icon. (The Z axis points out of the screen toward the user when the icon is in the position shown in Fig TSK 3b, so when an axis is difficult to display, it isn't shown on the icon.) The three X, Y, Z axis' start at a point zero along the X axis, zero along the Y axis and Zero along the Z axis. It is called the origin and an origin is always at a position 0X,0Y,0Z. It means distance zero in the X direction, distance zero in the Y direction, and distance zero in the Z direction. Since the user can zoom in and out, the icon will automatically find a default position within the screen display area - not necessarily at the current 0,0,0 origin position. However, it will always orient itself to show the current X,Y,Z directions. Navigate to the next page (or previous page) using the circular arrow icons below.